Watch the Top 5 American Idol Auditions for Country Music singers that went on to become major Stars. Enjoy this listing of the Top 5 American Idol Auditions for country music singers before they became major stars. While several country music singers have auditioned for American Idol, these 5 are the top talent that went on to become major Country Music stars. Enjoy watching each American Idol audition below and see if you have a personal favorite. Carrie Underwood auditioned for American Idol in 2004 and went on to win Season 4 of the popular show. Carrie’s mother and father drove from Checotah, Oklahoma to St. Louis, Missouri for the audition. Both Carrie and her mom are adorable in the audition video. At just 16 years old, Scotty McCreery performed Josh Turner’s “Your Man” for his Idol audition. He also showed his range by performing “Put Some Drive in Your Country” by Travis Tritt. Scotty went on to win the tenth season of American Idol in 2011 and became the youngest male singer to win the show. Kellie Pickler wowed the audience with her emotional life story and singing talent on Season 5 of American Idol. Kellie performed Kelly Clarkson’s “Since You Been Gone” for her audition song. Kellie ended up taking 6th place in the singing competition and then went on to win Seasion 16 of Dancing with the Stars. She went on to land her very own cable to show “I Love Kellie Pickler” on the CMT Network. At 15 years old, Lauren auditioned before Jennifer Lopez, Randy Jackson, and Steven Tyler and ended up winning her golden ticket to Hollywood. Lauren performed Faith Hill’s “Like We Never Loved at All” for her audition. 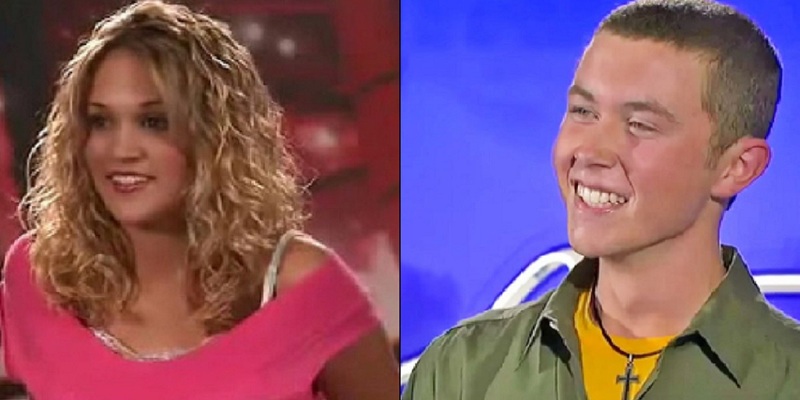 Lauren ended up taking 2nd place to Scott McCreery on the 10th season of American Idol. Kelly Clarkson was the stand out performer on her audition day. Then 20 years old, Kelly performed “Express Yourself” and “At Last” that clearly impressed all of the judges. She even took Randy Jackson’s place at the judges table. As a bonus, watch the complete American Idol journey of Kelly Clarkson below.